Chemical Modeling for Air Resources describes fundamental topics in chemical modeling and its scientific and regulatory applications in air pollution problems, such as ozone hole, acid rain, climate change, particulate matter, and other air toxins. A number of corroborative analysis methods are described to help extract information from model data. 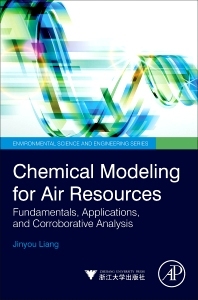 With many examples, Chemical Modeling for Air Resources may serve as a textbook for graduate students and reference for professionals in fields of atmospheric science, environmental science and engineering. Dr. Jinyou Liang is a recipient of Zhejiang 4th Thousand Talent Plan at Zhejiang University of P.R. China. He received four degrees related to the book contents: B.S. on Environmental Chemistry at Nankai University (1981-1985); M.S. on Atmospheric Chemistry at the Research Center of Eco-Environmental Studies, Chinese Academy of Sciences (1985-1988); S.M. on Environmental Engineering and Ph.D. on Atmospheric Chemical Modeling at Harvard University (1991-1997); postdoctoral study at Stanford University (1997-2000). He served in both China and US government agencies for clean air efforts. He worked in Chinese Research Academy of Environmental Sciences for two years and in California Air Resources Board and Bay Area Air Quality Management District for eleven years, to help develop and implement pollution mitigation measures from chemical modelling perspectives.